Congolese authorities have been urged to ensure two soldiers and a civilian sentenced to death for murdering a reporter face some form of punishment. A right groups says it fears as there is a moratorium on death penalties in the Democratic Republic of Congo those found guilty this week may be freed. 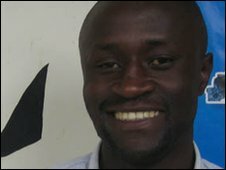 Didace Namujimbo, who worked for the UN-backed broadcaster Radio Okapi, was shot dead in Bukavu in November 2008. Several journalists have been killed in the volatile east in recent years. The BBC's Thomas Fessy in the capital, Kinshasa, says Tuesday's verdict at a military tribunal did not answer the question whether or not Mr Namujimbo was murdered because he was a journalist. Another seven people were given prison sentences from between 16 months to five years and five more were acquitted. Those found guilty, together with the government, were ordered to pay $500,000 (£330,000) to Mr Namujimbo's widow and $250,000 (£170,000) to his father. Human rights group, Journaliste en Danger, said in an interview on Radio Okapi that it hoped the three people on death row would not disappear from prison after a few months because of the current moratorium on capital punishment. The last death sentence carried out in DR Congo was in January 2003, when 15 people were killed in a group execution. However eight of those were put to death by mistake. This incident led to proposals in the National Assembly to abolish the death penalty in DR Congo, but in reality little is being done to achieve this, our reporter says. Another group, Protection International, has criticised the investigation into Mr Namujimbo's death. No autopsy was carried out on the journalist's body and the evidence was not kept properly, the group claims.